The Rich Invest for Cash Flow. The Others Aim for Capital Gains. Have you lost money or got burnt from an ‘investment’? Perhaps, you did. It can be painful. The level of hurt or ego bruised depends on how emotionally attached you are with money. – I lost 16% from my unit trust investment. 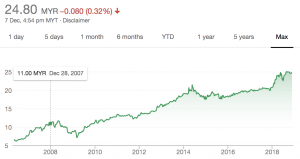 – My stock portfolio is downed by 30% in 6 months. – I bought Bitcoin when it was US$ 11,000. Now, it is US$ 3,300. – I am still trying to sell my property. The mortgage is now ‘eating me alive’. – I received an average of 5% dividend yield from my stock investment. – The gross rental yield from my investment property is 4% per annum. – ABC Bhd has made RM 0.50 in EPS in 2018, up from RM 0.45 in 2017. – I bought BCD Bhd at RM 0.50 and sold it for RM 1.00. – I bought an under construction property for RM 300k and flipped it for RM 500k. – I expect my unit trust to go up by 8% per annum. As I read, I realised that the common denominator for failures and losses from an investment stems from one’s desire to achieve capital gains. Most made an investment hoping that ‘it will go up’ and not ‘produce cash flows regularly’. It has become a root cause for many heartaches, hurts and even sleepless nights. How to Reduce Risk Significantly from Your Next Investment? I believe, one of the answers is to have a greater appreciation of ‘cash flows’. It is cash flow that makes the rich truly rich and the wealthy truly wealthy. Here, I would share how the ultra-rich got themselves richer from the same vehicles of investment that most people invest into today. Example 1: Who Makes Big Bucks from Unit Trust? Is it the investors or the companies that are selling unit trust as an investment? I think the answer is obvious. But, please be mindful that I am not here to start a blame game. Instead, my intention is to explain a major difference in mindset between unit trust investors and unit trust companies. Think about it. Most bought unit trust because of promises of capital gains over the long-term. Very few, or none at all, is mentioned about its ability to bring in cash flow. Most agents promoted ‘dollar-cost-averaging’ as a smart investment strategy in unit trust. From it, millions of investors poured in millions or billions of Dollars per month into unit trust funds in search of ‘Capital Gains’. So, what does it mean to unit trust companies? Answer: Abundance in Cash Flows. First, they earn sales charges from each unit transacted from their investors. Second, they earn annual management fees on their unit trust funds regardless of their performances. If a fund made profits, it pays itself higher fees. If a fund incurred losses, it pays itself lesser fees. It means, unit trust companies will ‘more or less’ guaranteed themselves stable sources of ‘Cash Flows’ regardless of how their funds performed in the future. Let us use Public Mutual as an example to illustrate how an ultra-rich looks unit trust as an investment. Apart from sales charges and management fees, I found that a handful of its funds invest their investors’ money into Public Bank. This is brilliant as Public Bank is receiving tons of capital ‘interest-free’, which allows it to be well-capitalised. Hence, to an ultra-rich, unit trust is a Cash Flow Business and an effective vehicle to raise funds consistently. I am not sure how well you did in your unit trust investments. 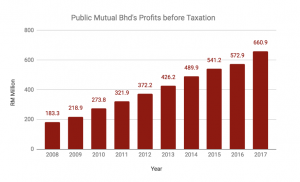 But, as for Public Mutual, it has achieved CAGR of 15.3% in profits before tax (PBT) over the past 10 years. Its PBT had grown from RM 183.3 million in 2008 to RM 660.9 million in 2017. Example 2: Why Value Investors Like Public Bank Bhd? Answer: Abundance of Cash Flows. For a start, most ‘investors’ are not really investing. They are trading, gambling, or speculating. How do I know? Simple. If I asked, ‘Why did you buy the stock?’ and his reply is, ‘I expected it go up because its stock price went up or down by 20% or 30%.’, then I know, chances are, he is a speculator or gambler. Investors view stocks as businesses. Investing is about being a part-owner of an enterprise. Instead of chasing stock prices, investors read annual reports. Why? Because they want to know, whether or not, the business is profitable and has the capability to generate ‘Cash Flows’ consistently. 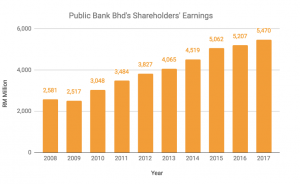 Take a look at Public Bank Bhd. Its shareholders’ earnings have grown by CAGR of 8.7%, up from RM 2.6 billion in 2008 to RM 5.5 billion in 2017. If an investor bought shares of Public Bank at the start of 2008 and held it to today, he would have made total returns of 171.5%, consisting of 125.4% in capital gains and as much as 46.1% in dividend yields. Hence, it is ‘Cash Flows’ that leads to ‘Capital Gains’ for a savvy stock investor. Example #3: How to Build Wealth Faster than Flippers? Let us use two men in their 30s as examples: Tom and Jerry. Tom is a flipper. He had bought an under-construction property at RM 400,000 with the intention of selling it at RM 600,000 upon receiving his keys to his unit upon completion. 4 years later, he managed to dispose his unit for RM 600,000 after receiving his keys. After deducting a RPGT of 20%, his final gain works out to be RM 160,000. Awesome! Jerry is an investor. He bought a property for RM 400,000 in a sub-sale market and rents it out for RM 1,400 a month. Based on a DSR calculation of 60%, the amount of monthly instalments Jerry is eligible for has increased by RM 840 a month. Based on the Rule of 200, Jerry’s mortgage eligibility would be revised upwards by another RM 168,000. Unlike Tom, Jerry is able to ‘cash out’ the RM 168,000 to fund his purchase of a new property almost immediately without the need to sell his current property 4 years later at a higher price. Why? Because Jerry is receiving Cash Flows from his property and bankers are happy to extend mortgages to investors as rent is recognised as one of the viable sources of income. This explains how property investors are able to keep on buying properties one after another. The answer lies in Good Cash Flow Management. The Rich invests for Cash Flows. The Rest aim for Capital Gains. Many lost money in an investment because of lack of skill, knowledge, and know-how but yet have a desire to achieve capital gains. Capital Gain Investors tend to handover money to Cash Flow Investors. Cash Flows often leads to Sustainable Capital Gains in the long run. « Previous Post 7 Investment Principles I Learnt from Berkshire Hathaway’s Annual Report Next Post » Investors Find Value. The Rest Focus on Price. 1 Response to "The Rich Invest for Cash Flow. The Others Aim for Capital Gains." The content is very informative and helpful. Appreciate the efforts put in by the author.